It’s all change in England. There seems to have been a shift in the balance of power in the Premier League, and the country’s Football Association has appointed a new national team manager. While the first phenomenon has been brewing for a while, with Manchester City’s shadow growing larger and larger over rivals Manchester United, the decision to go for Roy Hodgson as the man to replace Fabio Capello has surprised and disappointed a lot of people in England. I have to say I am not one of them. I actually think the 64-year-old is a good appointment. He is vastly experienced and has a better pedigree than all of the other candidates who were reportedly considered for the job. The only criticism I can find regarding the decision is how long it took to make. Surely the limited time he will have to prepare for Euro 2012 means the team's chances of success at the tournament will be affected. First I should explain why Hodgson is not such a popular choice for the English public. The hype around this job is always incredibly high, and everyone in the UK expects the man in charge to be charismatic and entertaining. To be frank, Roy is not seen to be either of those. Rather, he is a serious, intelligent and experienced coach who will steer clear of scandals and not give media and fans the headlines they have thrived upon in the past. He won’t be caught doing or saying something silly like Glenn Hoddle, Kevin Keegan or even Sven-Goran Eriksson, and he won’t be as easy to criticize as Capello was in recent times. Proof of how desperate tabloids are to make him entertaining arrived on Wednesday with The Sun mocking his speech impediment on its front cover. In his first press conference he was also asked about playing in an all-white South African league during the Apartheid-era – a question intended to trip him up right from the start. There will no doubt be many more grillings ahead, especially if England again fail to impress at a major tournament, but Hodgson has shown in his long career that he has the dignity and ability to cope. But England fans need to remember two things. Firstly, being manager of the national team is not a popularity contest. It is about getting results. Secondly, you need to lower expectations for major tournaments. Don’t forget, the nation hasn’t won anything since 1966! As for the FA's decision-making process, its chairman David Bernstein told the media on Tuesday that he was very pleased with how the appointment was handled. I have to disagree wholeheartedly. If you know you want someone English and you only have three or four candidates, why wait three months to pick a coach with such a big tournament around the corner? Bernstein said he had decided in early April that he was going to pick Hodgson, so why not announce it then? It is not as if West Bromwich Albion was involved in a relegation dog fight and would suddenly collapse after hearing the news. Surely the selection process could have been handled in a more professional and transparent manner. Furthermore, I don’t understand why Bernstein didn’t want to explain the reasons for choosing Hodgson ahead of Harry Redknapp. The Tottenham manager had been the front runner ever since Capello left his post, especially after being cleared in court of tax evasion charges, and everyone was left wondering why he wasn’t the chosen one in the end. So what next for Hodgson, who helped Switzerland qualify for both the World Cup and European Championship in the 1990s? The first thing he needs to do is choose his personnel carefully and decide who he is taking to Euro 2012. John Terry's race abuse court case will not be heard until after the finals in July, and the decision about whether to include the Chelsea captain in the England squad will come under much scrutiny. After that, win over the fans and the media. Easier said than done? Sure, but I believe he can do it. the tabloid media have a long history of undermining england managers. they called bobby robson a 'plonker', taylor was a turnip, the wally with the brolly, they set up eriksson with a non-existent false job in the middle east. they will do just about anything. they don't care about england being successful, just flogging their paper. hodgson is no mug, he has an interesting range of experience and knows his stuff. i'd have taken redknapp personally, but i'll back the appointed man. he shouldn't be judged by this euro, brazil 2014 will be a better gauge. who knows? we might do okay this summer with less expectation. Good luck to England with Hodgson. Personally, I am dismayed by the appointment of yet another Englishman, who will probably revert to the old, dour style of playing the ball in the air rather than on the field. The English team needs to play with flair and panache. Capello's apparent failure notwithstanding, they should've gone for yet another Latino coach, like Mourinho. I doubt that they'll do well at Euro 2012 with Hodgson, but then again, maybe that's not the priority here. All the same, best of luck. The rest of the world has seen British media for what it is (gutteral and thuggish), I hope Mr. Hodgson continues to stay on the moral high ground, and do a good job. I fully support his appointment, he seems to be a capable leader and a gentleman. Roy Hodgson is not a glamorous hire, (the English FA has tried that before and failed with Ericksson and Capello) but he is a safe pair of hands with the proven ability to get the best out of largely mediocre players, as he did at West Brom and Fulham and with Switzerland. His will be a disciplined hard to beat England side capable of making at the least the quarter-finals of most tournaments (provided there's enough time for him to stamp his style on the team before the Euros) and maybe the semis if luck goes their way. Flair teams can find it hard to cope with well organized resolve, as Barca recently demonstrated against Chelsea, and, given the shambolic debacle of England's 2010 World Cup campaign, one can see why the FA found Hodgson's reputation as a meticulous planner and skilled communicator appealing. Harry Redknapp would have been a more entertaining choice, but I don't see why the FA needs to explain its decision not to choose him as his elevation to "favorite" was entirely inspired by the media! We've no indication he was even a candidate. Had he been chosen, then England would have attempted to play the free flowing attacking football that Harry likes to play with Spurs. That's wonderful when it works, but, as we've seen in the latter part of this BPL season, it's calamitous when it doesn't. Redknapp would have been perfect had England been blessed with 4 or 5 Wayne Rooney's, but the fact is that the current England side is predominantly workmanlike so it makes sense to have a pragmatist like Hodgson at the helm. And there is a precedent for that kind of manager working for England, as Alf Ramsey was also an uncharismatic, utilitarian England boss... and he didn't do too badly did he. A media campaign of self interest to hype Harry Redknapp into the job only reflects that the uk media have their own selfish agenda at heart. They have the daily pressure of meeting deadlines and filling up their newspaper columns and time on air (T.V & Radio). They want someone exciting who is going to give them a story and an attention grabbing headline! Instead they have Roy, a dignified, experienced, professional and a mission is already underway to take him down when they have used up all the negative material they have stored away in the pipeline. The fact remains that England cannot produce natural footballing talent. England does not have anymore players for the traditional kick-and-rush style of play. Over the years the home players have been constantly rubbing shoulders against opponents from South America, Africa and the rest of Europe. Quick short passes, ball possession and such other intricate game plans have made the English footballers versatile and quick thinking. Foreign managers such as Hiddink, Wenger, Rafa, Jose, Andre, Mancini, RDM and others have introduced newer tools in the English tool kit. 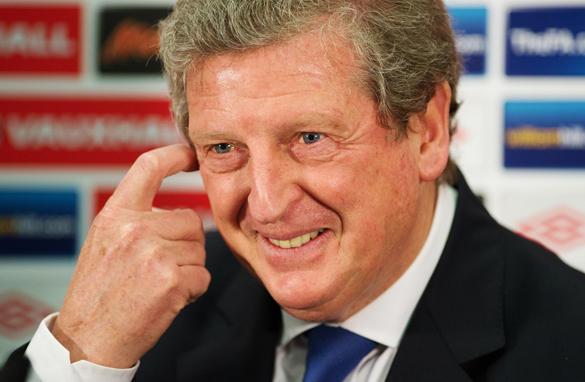 Roy Hodgson is a widely traveled football manager. His vast experience will come handy to get the desired results. Wishing Roy and the Three Lions success in the football arena. Not a wise decision .Hodgson with Euro cup 2012 in hands?.Never imagine that before.no offence,but for me,i dont think so England will doin well with roy.Remembering what ROY have been doin at liverpool side. I am a West Brom supporter in the US and I am sorry to see him go but delighted that he got a job he both deserved and wanted. He is a class individual with loads of experience in both the UK and international level. His stint in Liverpool is a blemish but other than that he has a cv that will stack up against anyone. For those who wanted Redknapp, blame Redknapp. The job was his for the taking. Either he didn't want it or he thought the FA would cave to any demand he gave. As an American and Baggie supporter I say best of luck to both Roy and England. John G May 1, 2012 Graham Taylor never played the Le Tess as he didn't fit the style. The reslut was Le Tess never played the amount of games he could of done for his country, even in his prime.England are in a right mess coming into the Euros if comparison to 5/6 of teams. I think we should just relax and look to build long term.